Tips and trends : What’s in a webinar? ALA has a long history of offering free staff development webinars for its members. We’ve noticed that some members seem a bit unsure about what’s involved. Webinars are seminars or presentations that are conducted online using the Internet and that allow for interaction between the presenter and the participants. Webinars are convenient – bringing professional expertise and presentations to your office or home. They also give you the chance to meet and network with people engaged in the same kind of work and interested in the same issues as you. Here are our tips for getting the most out of the experience. All you need is an Internet connected computer, a link to the webinar ‘classroom’, microphone and headphones. Webinars, like classes, are scheduled for a particular time and day. You can see as well as hear your presenter who can share PowerPoints, video and other content with you. In most webinars, you can interact with the presenter and other participants in real time through instant messaging. Some webinars are free, others aren’t. 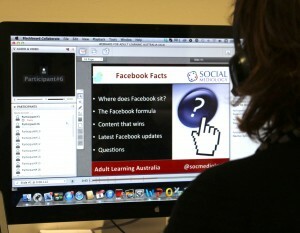 Some organisations offer webinars as a means of attracting business or marketing a new product. Choose webinars that are worth your time and offer practical skills that you can use in the workplace. Let yourself into the classroom ahead of time to make sure you can access the room and to give yourself a chance to try out the tools and features you’ll be using during the session. Arriving early also gives you time to test that your headphones are working OK and get any help you need before the session starts. If you miss the session, remember webinars can also be recorded and stored for later access. Make a list beforehand of the things you want to learn in the webinar and the questions you’d like answered. Some presenters will allow time for questions during the presentation, others will leave them to the end. Either way, don’t be shy. You’re not only meeting a new presenter at a webinar but other participants as well. Don’t be afraid to share ideas and chat. Be alert to potential collaboration and networking opportunities. After the webinar is over, review your notes and plan ways you will incorporate what you learned into your work. Check out upcoming webinars under Professional Development on the ALA homepage.